The Living Christmas Tree in 2002. A beloved Christmas tradition that has been a part of the Glades community for three decades is ending on a high note this year. 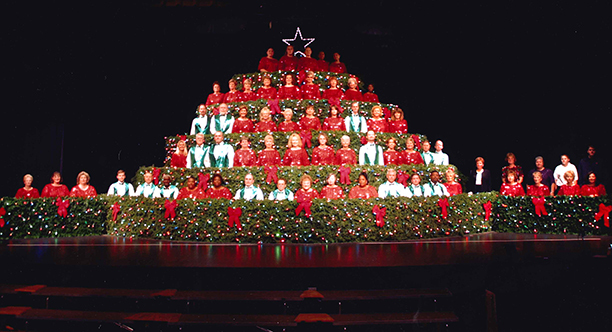 On Dec. 2, Palm Beach State College’s Belle Glade campus and the Dolly Hand Cultural Arts Center will present the 30th and final production of its Living Christmas Tree performance. The event, titled “A Holiday to Remember: 30 Years of Favorites,” will feature more than 100 children and adult volunteer choir members from the Glades community who will sing popular selections from the past three decades such as “Holiday Rock,” “Light Up the Tree” and “Let it Snow.” It takes place at 3 p.m. in the Dolly Hand. Tickets are $5. Leigh Woodham, director of the Dolly Hand Center, says that the show was a sellout for more than 20 years until the economic downturn. She sang in the choir for the past 27 years and says it was truly a pleasure to watch it grow. She says putting on the program each year requires a lot of effort and there aren’t enough volunteers to keep it going as the choir director, accompanist and many of the singers are retiring. The show also lost its children’s choir director, Becky Watson, a former music teacher who led the children for 27 years. Watson passed away last year. Director Carol Schmidt, a retired music teacher, has led the adult choir for almost 30 years. She is also the director for the Young Singers of the Palm Beaches’ Choir in the Glades, who will be joining the program for this final performance. Schmidt will be joined by accompanist Karen Corbin-Wheeler, who has also been with the program for almost 30 years. Schmidt will also be joined by her daughter, Monica, who began signing in the choir when she was in her teens, and granddaughter, Ashlyn, who has sung with the group since fifth grade. Schmidt says the show’s final performance will be bittersweet. “We all want to go out on top, and we will do just that,” she says. For more information, call the box office at 561-993-1160 or visit www.dollyhand.org.